We offer multiple engagement models Fixed Cost/Duration, Time & Materials, Project Engagement Model, Offshore and Onsite Engagement Models. 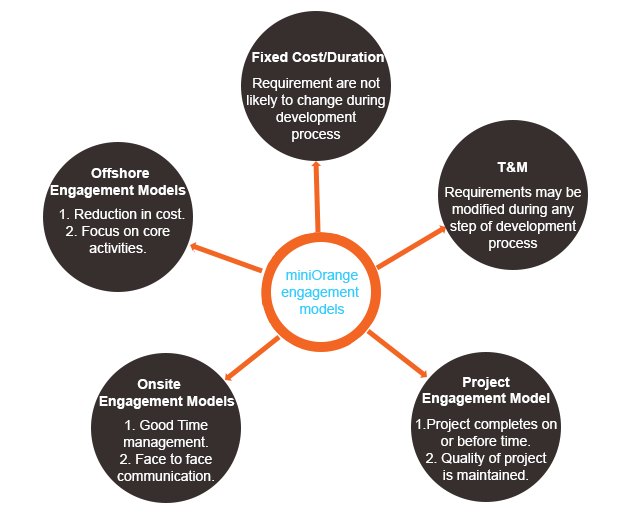 Xecurify offers multiple engagement models Fixed Cost/Duration, Time & Materials, Project Engagement Model, Offshore and Onsite Engagement Models. Projects that are built having fixed cost and duration is Fixed Cost/Duration. It is most common delivery type method where endusers are the buyer of the product or service. This type of engagement-model is used where requirements are not likely to change, feature enhancement follow only after project implementation. Projects which are depended on number hours spent on the tasks, requirements might change during any step of development process. Total execution time of project is not predicatable due to changes in requirements. We support organizations to outsource the entire project or a part of it. We support end-to-end software development with defined deliverables. We take full responsibilty for completion of the project on or before time, the quality of project and maintenanace of project. Reduced turnaround time and eventually generating more profit. Requirements are collected in shortest possible time. Data is secure and cannot leave client premises.